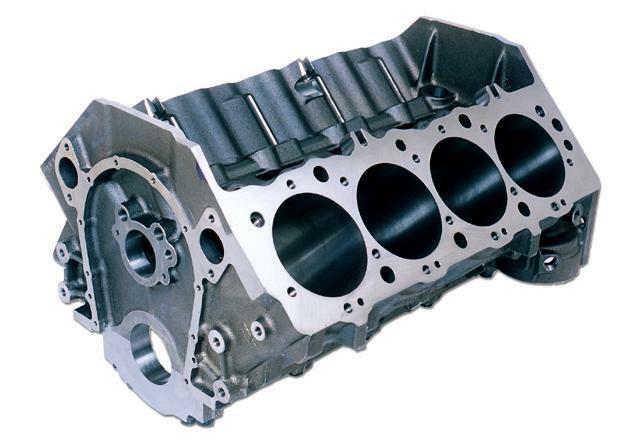 With deck heights of up to 9.800” and 10.200” and bore sizes of up to 4.310”, the Big M Full Water Block gives you the versatility to build a wide variety of engine combinations. A true priority main system oils the main bearings before the lifters for added reliability. The Big M Full Water Block is fitted with 4 bolt main caps for bottom end strength. Standard 9.800” and tall 102.00” deck heights available. Standard 4.250” or 4.310” bore sizes. Uses +.300” tall Gen VI style lifters. Modification for MRK IV style available. True priority main oiling lubricates the main bearings before the lifters. Our stepped main oil gallery (9/16” to 1/2” to 7/16”) increases the flow of oil to the crank at high rpm, and our front oil crossover eliminates internal oil leaks around the distributor shaft. 4 bolt main bearing caps in ductile iron have splayed outer bolts for extra strength. MRK IV blocks use the 2 piece rear seal design, while Gen V and Gen VI blocks use a 1 piece seal and a different timing cover pattern. Standard BBC cam and main bore. Coated cam bearings, freeze plugs and dowel pins are included.